Who am I: My father-in-law was Judah. I gave birth to two sons that were illegitimate. They were the beginning of the two lines of Judah. Their names were Pharez and Zarah. In this age of the "social gospel" and other forms of modern paganism, your Bible reveals the WAY to worship and serve the true God. It is a way that brings BLESSINGS - a way based upon obedience to the active LIVING LAWS of God. 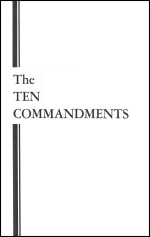 Here is the answer to a request from thousands - a booklet expounding in detail - the great spiritual LAW of Almighty God as summarized in the Ten Commandments. Your Bible contains the real WAY to peace - happiness - SUCCESS! It is a WAY OF LIFE based upon a spiritual LAW that is as moving, as active, as REAL as the law of gravity! It is a way to live by - and be BLESSED.